▶ 2 dynamic and 2 armature driver musician, enhance more bass and details in earphone. ▶ Detachable 2Pin cable hifi earphone, gold plated pin, easy for you to change cable with your needs. ▶ Metal shell, more fashionable and durable than plastic shell. ▶ OFC copper wire, 3.5mm audio jack suit for most smartphones and devices. ▶ This TRN V80 earphone perfect suit for bass enthusiasm, rock music. ★ KINBOOFI offer 12 months warranty from the date of purchase. ★ Feel free to contact us if you have any questions, we will reply you within 24 hours and give you a satisfied solution soon. 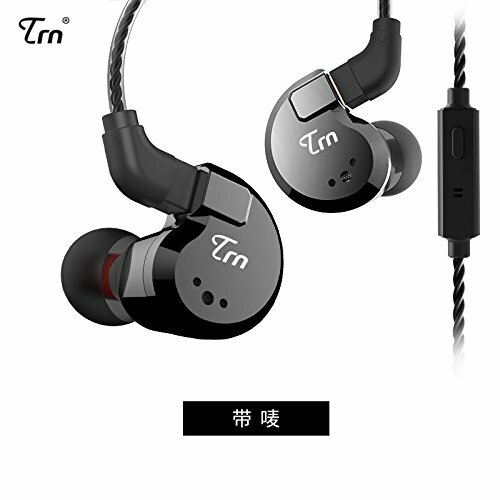 【2 DD + 2 BA Stereo Bass In Ear Monitor Headphone】TRN V80 musician earphone equipped with 2 dynamic and 2 balanced armature driver. Hybrid Quad drivers hifi headphone, with 10mm and 6mm double dynamic driver, enhanced more bass in sound. 2 balanced armature response for high and mid for music, add more definition and show more details in music. 【Metal Shell HI- Fidelity Stage IEM Earbuds】These Studio IEMs are designed with the Aluminum Metal Shell, more fashionable and durable than ever. Carefully precision CNC-machined before being hand-polished to a mirror finish and then varnished with 3 layers of tough enamel coating. 【Quality Earphone Cable and 3.5mm Audio Jack In Ear Headphone】This TRN V80 IEMs uses the OFC copper cable, decrease the loss of the music details, more durable. 3.5mm straight audio jack suit for most smart devices, such as Shanling, Sony NW-A45 music player, android phone and so on. 【12 Months Warranty】Buy with Confidence. KINBOOFI Audio have the Formal authorization from original company, all products are original. You will get 12 months warranty and friendly customer service from the date of purchase if you buy from KINBOOFI .